Music is the muse for many things, including this beer. Brewed un-cut and un-edited in ‘single-take’ batches, this Belgian-yeast fermented Session Ale is playful, effervescent and wonderfully aromatic. Bryan is a long-time fan and admirer of musician Neil Young. His ‘single-take’ style of recording lends a raw, honest and unvarnished quality to his music. This is the quality we are after in Baird Beer. I love to drink beer every day. I enjoy immensely the wonderful aromas and flavors imparted to beer from hops. 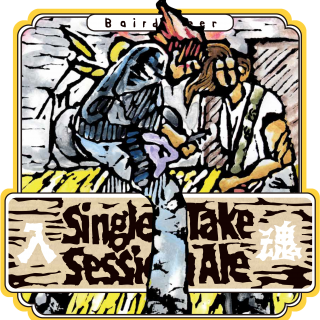 Single-Take Session Ale is one of my favorite every day beers as it manages to be both moderate in alcohol strength and yet full-on in hop character. Yeast is the transformative ingredient in beer. Brewers brew wort (sugar water derived from the mixing of water with milled grains at controlled temperatures); yeast ferments this wort (metabolizing the sugars and converting them to CO2, alcohol and tertiary flavor byproducts) transforming it to beer. Beer yeast breaks down broadly into two categories: Ale (Saccharomyces cerevisiae) and Lager (Saccharomyces pastorianus). Within the world of Ale yeast there are countless strains and ones with a Belgian lineage tend to be very distinctive in the flavor byproducts they produce. Provocatively pleasant notes of fruit and spice are characteristic. In crafting Baird Beer, we choose not to filter the yeast out of the beer. It remains in the packaged beer where we put it to the task of fermenting a second time. This produces a tight, fine natural carbonation and also provides some protection against oxidative degradation of the beer over time. Single-Take Session Ale, fermented as it’s with a yeast strain of Belgian Witbier lineage, showcases these distinctive fruity-spicy-peppery yeast-fermentation byproducts. 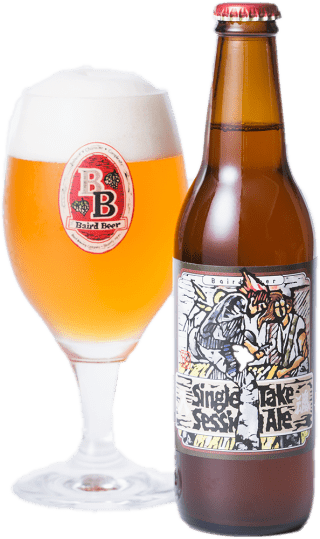 Lower in alcohol and higher in hop flavor and aroma than most Belgian ales, Single-Take is a wonderfully sessionable example of the idiosyncratic world of Belgian yeast-fermented Ale.